I later discovered, the real reason I felt the need to constantly switch things up was because I really had no concrete idea of what my brand was about or who I was designing for. One day, I was a wedding photographer, the next, I was shooting real estate. I went from logo design to watercolor art. It took me years to realize that by trying to do it all, I was spending loads of extra time pricing every new type of project, learning new skills, and tinkering with my style and design to try to cater to...everyone. I'm here to tell you, it doesn't need to be this hard. You truly can have confidence in the style of the images you post, colors you choose, and even words and captions you write—all by taking the time to make a plan. When rebranding and launching Evernew, my biggest task was narrowing down. I learned from some amazing teachers (Scott + Elise Grice, Being Boss, and Hilary Rushford to name a few) and came out on the other side with a much more concise view of who I was serving and what needs I was meeting for them. As a visual processor, I immediately started pulling together color samples and Pinterest boards to show what I felt deep down about what this business should be and do. These collections morphed into what I consider my brand's Visual Strategy Guide. It lives partly in two Pinterest boards (which I share more about in the video below!) and also in a google doc with all my core phrases, details on my dream client, and lists of the colors and themes for Evernew. I call it a Visual Guide, but it also leads and shapes much more than just your visuals (what I would consider your graphics and images). It shapes what I write, captions I use, topics I share about. When you're laser focused on who you're serving, talking to, creating for – oh how much simpler it all becomes! So go ahead and download the worksheet below and then we can walk through it in the video together! You may feel like this is redundant, but knowing your message in and out will transform how memorable your brand is and how powerful your visuals are. Ask yourself, "What's one way that I'd like to make the world a better place? Why, at the deepest level, do I care about what I do?" 2. Define your dream client. Visit your "dream client" on Instagram or Facebook – What things are they talking about? What words do they use? What do they complain about? What brings them joy? What are their hobbies? Put together a short Google Forms survey and send it to a few friends who fit your dream client description. Ask them what their dream day looks like, their biggest frustration regarding ______, what blogs they follow, what inspires them, etc. The visual details are simply the icing on the cake, the wrapping paper on the gift. It's your way of packaging your message in a way that will draw and compel your dreamiest client. Artifact Uprising is one of my favorite examples of this. They have a couple beautiful taglines – "Honor that which is meaningful." "Inspired by the disappearing beauty of the tangible." And it's clear from their visuals that they value prioritizing and preserving what's important: relationships and experiences. So you see on their Instagram feed these themes woven through out: pictures of travel, families, home, simplicity, beauty. 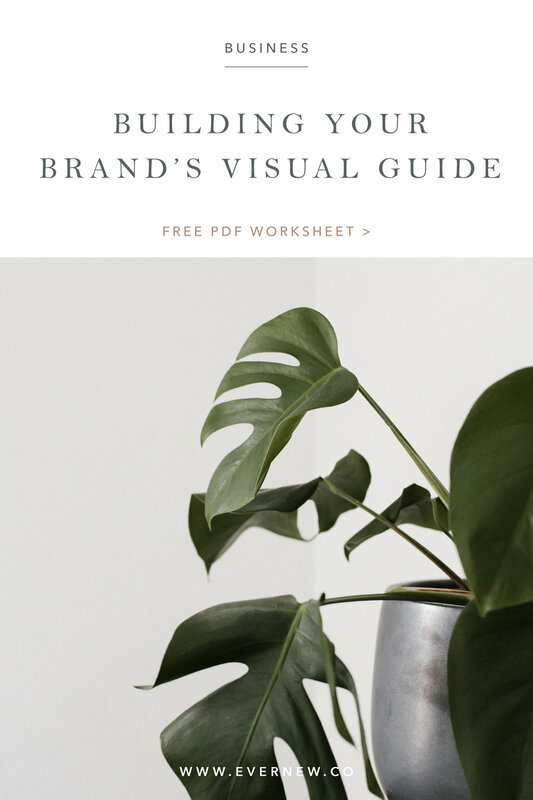 I hope once you've put in some time to define and refine your brand's message and visual strategy, you'll find your heart and story spilling over every piece of content, Instagram post, or newsletter. Leave a question in the comments below if we can help clarify anything or link to your Pinterest boards to inspire the rest of us!